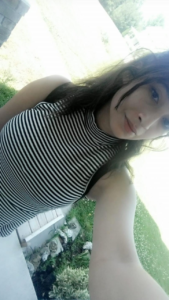 Meet NCVPS Super Student Stephanie C.
North Carolina Virtual Public School > News > Super Students > Meet NCVPS Super Student Stephanie C.
NCVPS Super Student Stephanie C.
I have been taking online NCVPS classes for about four years. First was Psychology for two years, and it helped a lot with my health problems that I had, so it made things easier. And It helped with the pace that I learn at. I could go at my own pace and still get things done and turned in on time. I never had to worry. My advice to other online students, DON’T PROCRASTINATE. Some of my favorite internet sites . . . that is a hard one. I hardly ever go online. I mainly use Dramafever to watch all my shows. I usually just only use my phone and my computer. I don’t normally like social media as to there is too much drama. Too many negativities can bring you down. A personal goal I had this semester was to stay in school, to stay focused, to not give up on anything, and to not let any negativity come my way. I told myself that I could do it. Although I may not have had the grades I wanted, I am actually pretty proud of myself. I love pandas. I love making new friends. Every time we have a new person in class, I try to walk up and make a conversation and try to make them feel comfortable. My favorite book is Winter Girls, but my favorite author ever is Haddix. Amazing books. They are mystery books. I love anything that can grab my attention, that I can personally relate to. I love getting so into a book and that it seems like you are that character. My favorite english band is Mayday Parade. I love songs that I can relate to as well. And my favorite Korean band is BTS. And Tao and Luhan are my favorite Chinese artists. I watch a lot of Korean shows, so my favorite show is My Love From Another Star. My favorite movie is The 5th Wave. Anything to do with aliens grabs my attention, mainly because I like to think that there actually is other life out there. I love to write songs. Singing is my passion. It calms me down. I used to dream of being a singer. I love writing, not just songs, but writing. Just about anything and everything. It absolutely helps. A couple things I would like to say about myself, but also to others. You may think that not everything is perfect, and you may be stressed out. But I promise you will make it through. I can say from experience. I believe in every single one of you.